Schenectady, N.Y. - Proctors proudly presents the international music sensation Voca People on the Mainstage, Saturday, April 20th at 8pm. The a cappella comedy experience of Voca People embraces enchanting a cappella harmonies, physical comedy, the art of Beat Box, and other "mouth music." The charming and hilarious snow-white, ruby-lipped aliens are entwined in perfect harmony. This purely vocal performance will send you into orbit and leave you grinning ear-to-ear! What began as an overnight YouTube sensation is now a world-renowned show that has dazzled audiences in over 20 countries around the globe since 2009, from South America to the USA, Canada, Europe and the Middle East. 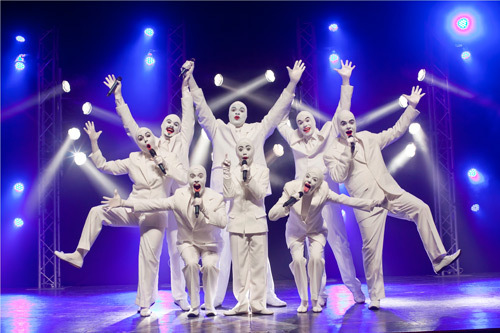 Voca People played for over a year Off-Broadway and is New York City&apos;s 2012 winner of the Lortel Award for "Theatrical Experience," a prize first claimed by Blue Man Group. Featuring over 70 songs from Mozart to Madonna, from Run DMC to Queen, this family-friendly a cappella show has no instruments and no soundtracks-only stunning vocal talent! Voca People consists of eight vocally-talented musican-aliens: three female alien singers that bring the very best alto, mezzo and soprano sounds; three male aliens -bass, baritone and tenor, and two incredible beat box aliens that create extraordinarily un-human sounds. THE STORY The Voca People spaceship is crashing on the unfamiliar planet Earth, sadly discovering that their precious spaceship charger (musical energy) has completely emptied. Slowly, the Voca People learn about the strange citizens of Earth, and with the help of the audience, musically recharge their unique spacecraft. "The coolest show playing off-Broadway, fantastic!" or "The coolest show ever!" - Jimmy Fallon, Late Night With Jimmy Fallon "Simply great! A knockout! You leave the theater feeling entertained." -The New York Times To purchase tickets, call Tickets by Proctors at 518-346-6204 or visit proctors.org.